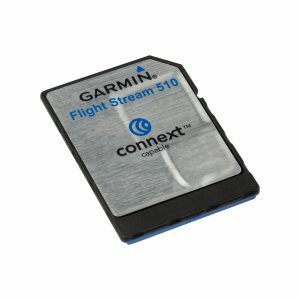 Garmin’s just-announced Flight Stream 510 multimedia card enables wireless GTN database uploads, flight plan transfers, ADS-B app support and more, without the need to install any new avionics hardware. The next avionics breakthrough from Garmin has arrived. It looks like a typical SD card that you might use to upload navigation data to your GPS receiver, but it’s oh so much more than that. The Flight Stream 510 MultiMediaCard (MMC) provides wireless connectivity between the Garmin Pilot app and GTN 650/750 touchscreen navigators with no remote unit to install, no wiring and no antennas to worry about. Amazingly, this one tiny card does it all. With Flight Stream 510 you can wirelessly update navigation databases in the cockpit, upload flight plans from the Garmin Pilot app to the panel-mount avionics (and vice versa), broadcast ADS-B traffic, weather and GPS information to the app and receive backup attitude information when paired with Garmin’s G500/G600 retrofit cockpit. The card slides right into the face of the GTN navigators and automatically syncs with your iPad or Android tablet when you enter the cockpit.